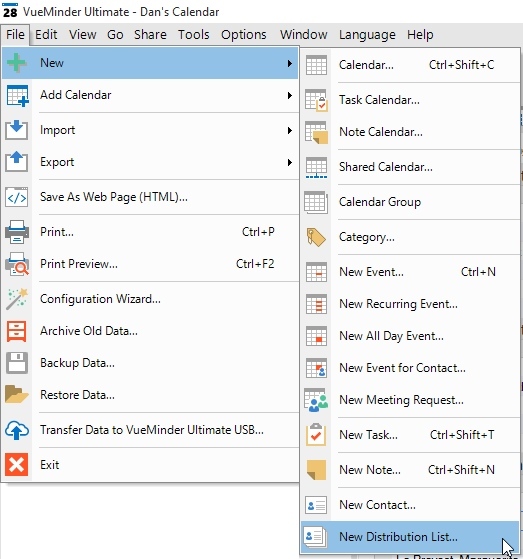 Use the "New -> Distribution List" command on the File menu or the task tray icon's right-click menu to create a new distribution list. Double-click an existing distribution list in the Distribution Lists area of the Contacts List. Right-click the Distribution Lists area of the Contacts List, and select either the "New Distribution List" or "Open Distribution List" commands from the popup menu. Click the "..." button in the Distribution List field when defining the recipients for an email, text message, or voice phone reminder. Click the "..." button in the Distribution List field on the Meeting tab of the Event Editor. Distribution lists can be used for sending email reminders or meeting requests to a pre-defined group of contacts. The Distribution List Editor is used for creating new distribution lists or modifying existing ones. 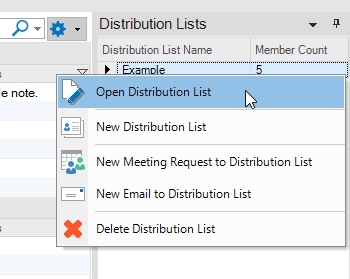 To create a new distribution list, use the "New -> Distribution List" command on the File menu or right-click the Distribution List area of the Contacts List and select "New Distribution List" from the popup menu. To edit an existing distribution list, double-click the list's name or right-click and select the "Open Distribution List" command. 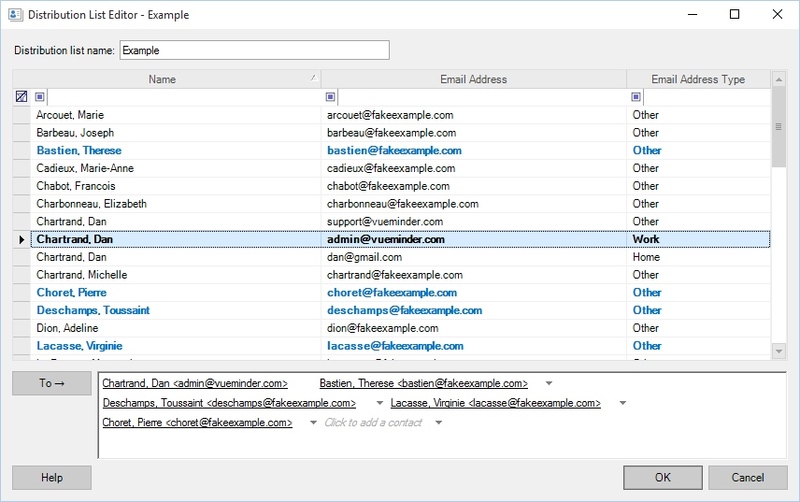 The Distribution List Editor will show all contacts that have at least one email address. Contacts that have multiple email addresses will have multiple rows - one for each email address. Contact rows that already exist in the distribution list will be colored blue and made bold. To add a contact's email address to the distribution list, double-click the contact's row or single-click the row and then click the "To" button. Multiple rows can be selected by holding the Shift or Ctrl keys while clicking. When defining a new distribution list, a name can be entered. Previously created distribution lists can't be renamed, but their contacts can be added or removed. To remove a contact's email address from the "To" box, select the email address text and clear it out using the Delete or Backspace key. A filter row is provided at the top of the list. When values are entered in the columns of the filter row, the following rows will be filtered to only show matching contacts. For example, to filter based on a contact's name, enter a partial name in the "Name" column of the first row. All contacts that match the specified query will be listed. Other contacts will be filtered from the list.